do you think you could add banner support? I want banners I make to show up hanging on my characters' back, is that possible? Didn't mean to trouble you! I agree. It would be a cool thing to have! You might suggest that in Noppes's suggestion channel on Discord. Hi, I'm trying to use this mod in 1.12.2 and none of the animations work with and without mods Please help also nothing works. Press F12, goto Options and disable compatibility mode. When you join a world/server, do these steps again because this might be a bug, it should be fixed in next update! I would guess the UI's of those mods are incompatible with MPM. Player in multiplayer/server can see the HD skins too (when they have the mod of course) or it is just a single player mod please ? I guess it is a "yes" ? => "Remember people joining need to have More Player Models installed, otherwise they wont see models." (from link). They need the mod too, yes. I am playing on 1.7.10 and I cannot edit my player. Any suggestions to fix this??? It's likely an incompatible mod. You could try switching compatibility mode either off or on. If that doesn't work and you really want to use MPM, you could try looking for the mod conflict. I do this by removing half my mods (starting with the biggest so MC loads faster) and checking if the mod is still not working. If it works, then the conflict is likely in the mods you removed. So add in half of those and check again. Continue this until you narrow it down to one mod or a set of mods. 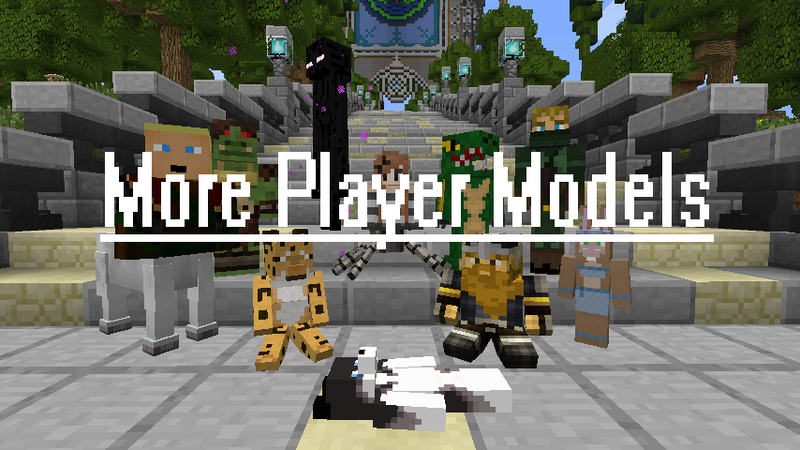 To help you start, you could check the CurseForge pages for your mods and see if they say anything about altering the character model. Usually those kinds of mods will conflict. Will we be able to make our playermodels hunchback and move legs farther apart? If I make my character smaller, ,the hitbox dosent Change. Is There a way to move the hitbox too ? It says here that changing the hit box may be added in the future but is not currently possible. If you want a similar mod that allows you to change your model to another entity and that also changes your hit box, you could try out iChun's Morph (you'll also need this library to go with it). It is currently incompatible with at least some of Noppes's mods (specifically Custom NPCs), but the issue has reportedly been found and is being fixed. Jesus man, you just Safed my day, thanks ! Is there an inner skin? It might be messing up if you are using a skin texture made for an old version of Minecraft. It could also be that you're trying to place a Steve texture on an Alex model or vice versa.